Powernail pneumatic angle flooring nailer 445 LS. The Powernail 445 is a pneumatic flooring power nailer which uses 16 gage cleats for the installation of Tongue & Groove hardwood floors. Power nailer package includes a white 3MI mallet, lube oil, 2 box wrenches, 2 allen wrenches, extra driving blade, 3/4" & 5/8" adapter pads and 2 shims. The standard configuration is a long handle with a short channel (L/S). 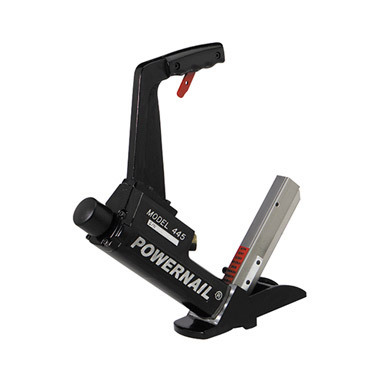 The Powernail 445 is recommended for nailing 5/8", 3/4" and 33/32" flooring.